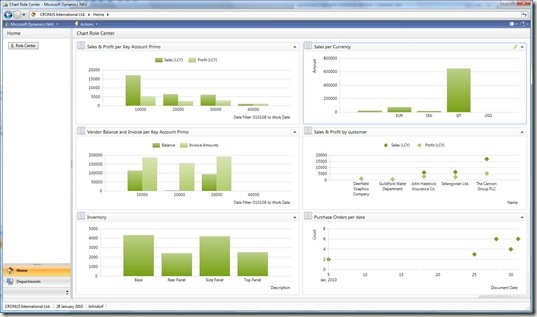 Microsoft Dynamics NAV 2009 has a new graphical object type called Charts or KPIs (Key Performance indicators). 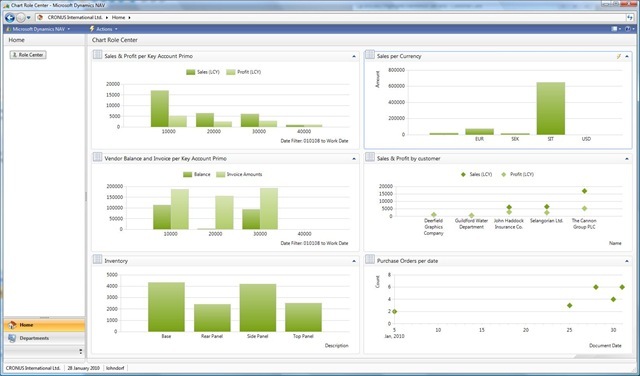 It is a way to create simple graphical charts, to give a visual overview of key figures. This post describes what you can and cannot do with charts, and it contains some sample code to how you might create a “Chart Generator Tool” to make it easier to generate new charts. A chart must be based on 1 table, and 1 table only. You can’t combine data from multiple tables. You have two basic chart types: Points or Columns. You can have any colour as long as you want green. Charts can use one of two operators: Sum or Count. You can only apply static filters in charts, i.e. you must type in (hardcode) the filter when you generate the chart. A chart has a simple layout. You choose the table to base it on, then a field from that table to show along the X-Axis, and – if needed – a filter on this table. Then you select what data from the table to show on the Y-Axis (also called Measure). A measure can be based on Sum or Count. You can display multiple measures in the same chart. Start the new client, then click on the “Customize” button in the top right corner (just left of the ?-button), and select “Customize this page”. From there you can add a new Chart part. So add one of them, move it left / right / up and down to where on the page you want it. Click the “Customize Part”-button to select which chart to display. This button looks up into the Chart-table in NAV (table 2000000078) and lets you select a chart. You can personalize the page again to remove a chart, or click “Restore Defaults” to remove any personalization. You can also remove any personalization (including any charts that a user has added) with the classic client, from table 2000000075 “User Metadata”. This is the table that stores the personalization for each page for each user. Deleting a record from this table removes any personalization made to that page by that user. Charts are stored in system table 2000000078 “Chart”. You can view them with form 9182 Charts, or from Administration -> Application Setup -> Role Tailored Client -> Charts. 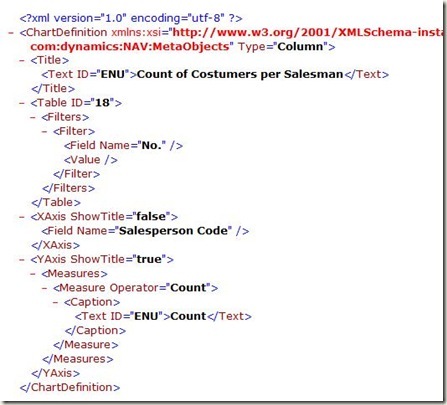 Charts are defined by xml documents which are stored as BLOB fields. 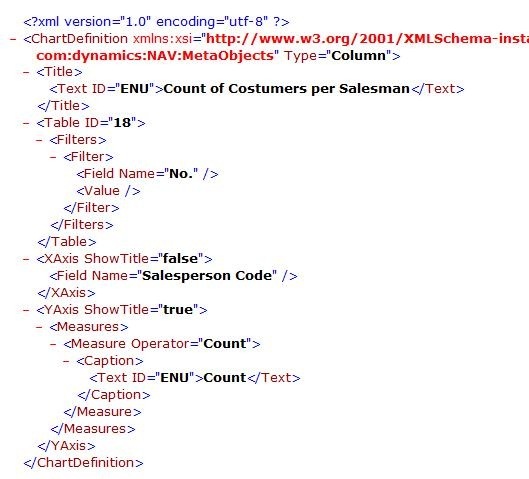 You can export a chart to an xml document, then modify the xml document, and import it back as a new chart. You must specify exactly one Table ID. You can only have one X-Axis. You can only have one Filters-element, but it can contain multiple Filter-elements. You can only have ony Y-Axis, but it can contain multiple measures. Measure operator must be either Count or Sum. Modifying xml documents can be tedious. But it can be made easier with tools. Below, I have put some sample NAV code, how such a tool could be made. The code below is only supplied as an example of how such a tool could be made. It is completely un-supported and to be used at your own risk and responsibility. The code below is provided in Text format. When importing text objects into NAV directly, you will not get any warnings whether to overwrite existing objects. So each object has been deliberately changed by adding [RemoveMe] in front of each Object ID. This would have to be removed, after reviewing each Object type and number, to check that it would not overwrite any existing objects! Hit F3 to create a new chart. Enter ID and a Name. As a minimum you must specify Title, “Table ID”, “X-Axis Field Name”, and one or more Y-Axis fields. Once you have specified the chart definition, then click on Chart -> “Generate Chart”. This will automatically either update an existing chart, or generate a new chart in table 2000000078, ready to be used from the new client. Create a new chart (F3) from the Chart Generator card. As ID, specify INVENTORY. As name, also enter Inventory. Set Table ID = 27 (Item). Leave Type as Column, and select what to display along the X-Axis – let’s choose Description. Click on Chart -> Y-Axis (or drill down on the “YAxis Fields”-field). This is where we choose the measure, in our case Inventory. So look up in the field “Y-Axis Measure Field ID” and select Inventory. Leave the Caption, and the “Measure operator” to their default values, and go back to the Card Generator form. Finally, to avoid showing 100s of items on the chart, click on chart -> Filters. Now the definition of the chart is done. To make it available in the new client, click chart -> Generate Chart (F11). If you want to change the chart definition, then just make the necessary changes from the “Chart Generator Card”, then hit F11 again to update the existing chart. Now the chart will be available for the new client as described above. If you update the chart, then the new client will use the new chart definition next time you restart it.